Are walks turning into a clash of strong wills, as your dog constantly pulls on their leash? Are you worried your pooch might seriously hurt himself or herself while struggling? 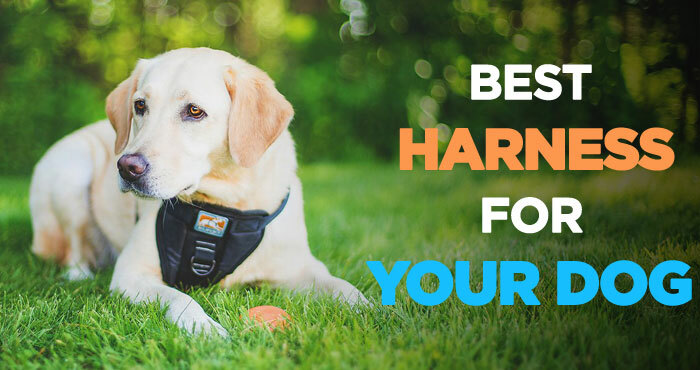 If this describes your dog walking experience, then this guide on the best dog harness on the market might provide a much-needed reprieve for you. 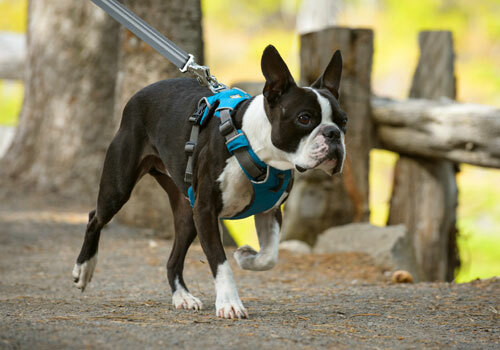 Dog harnesses are a perfect addition to any outdoor activity. Dogs that enjoy long walks, running, hiking, biking, and hunting can all profit from the comfort and safety of a good dog harness vest. Many of you might not have had an experience with harnesses and might think they’re not right for you – as this article will reveal, there exists the perfect harness for dogs of all breeds, shapes, and sizes! After reading this article, you’ll know dog harnesses inside out. Read on for thorough information on harnesses, our recommendations for the best ones on the market, and much more! Note: Above ratings are based on our experience with the product and/or expert opinions. Click the link above to read best dog harness reviews and see the current prices on Amazon. Dogs and owners alike can benefit from dog harnesses in many ways! The best models of dog harnesses sport brightly colored, reflective materials. The bright colors help when it’s hunting time and dogs might be mistaken for prey. They will be protected from road accidents as the harness’ bright colors will warn all drivers of a dog on the road. Furthermore, dogs pulling on their dog collars and leashes when training to be walked can sustain serious injuries. The harness redistributes the power of the pull, so that those injuries can be easily prevented. By choosing the best harness for small dogs, in particular, owners can prevent bad behavior, such as slipping away from the leash! The harness is so secure, even the smartest dogs can’t get away from it. Last but not least, a harness is a great benefit for all pooches that aren’t completely healthy. That includes dogs that might suffer from arthritis, osteoporosis, or any other condition that causes them pain. Moving these dogs might be very painful for them. A harness helps you by providing more structure when you’re picking them up. All of these are excellent reasons why every dog owner should consider purchasing a harness for their furry friend. Decided that a dog harness is a good choice for you? Excellent news! Mainly, there are three different types of dog harnesses out there, and all models on the market more or less work in variation of those types. Let’s take a look at them and explore what each one is good for! 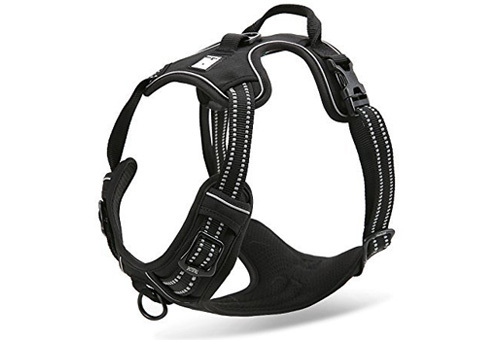 The back attachment harness has the leash attachment at the dog’s back, right between the shoulder blades. 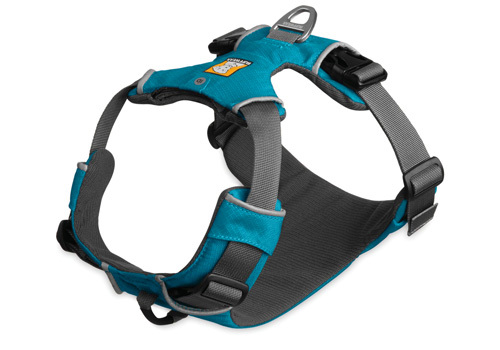 The best use of the back attachment harness is to replace a collar for taking the pressure off the pooch’s neck. This might be necessary if they’ve suffered some sort of injury, trauma, or are recovering from treatment in that area. This harness is also perfect for jogging along with your dog, as it can very easily attach to your belt and not be in your pooch’s way when you’re out for a good run. However… if your dog tends to pull on their leash, this is not the model for you. The pull from behind will actually encourage your pooch to pull forward, trapping both of you in a vicious game of ‘Who can pull the hardest‘! So if you want to encourage your dog to drop the pulling habit, choose another harness. 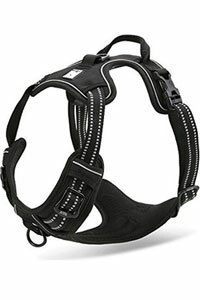 Front attachment harnesses, on the other hand, are ideal for training dogs not to pull on their leashes. 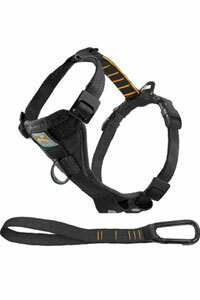 As their name suggests, the leash attachment for these harnesses is at the front, in the middle of the chest. Therefore, when your dog pulls really hard, the leash gives them a tug to the side, turning them to you. This is the opposite of what they want, so they will get more and more discouraged to pull on their leash with every walk! Out of all the available models out there, this is definitely the best dog harness for walking your dog. Over time, even if your dog is a tireless puller, they will learn that their efforts are getting them nowhere and will, eventually, drop the habit. By comparison, the front attachment harness is definitely not as effective as the no pull dog harness for jogging and running with your dog. Head harnesses are also known as head collars. Referring to them as ‘harnesses’ is a bit of an overstatement, but retailers generally categorize them as harnesses. Besides, they’re a great method of teaching no pull behavior, so I’m including them in this article. With head harnesses, the leash attachment is right under the dog’s chin. When a dog starts pulling too much, the harness makes their head turn with the force of the pull. That’s a sure-fire way to stop them dead in their tracks. This collar has an aversive aspect to it, making the dog associate pulling too hard with stopping the walk. That’s the last thing a pooch wants when out for their daily stroll, so they will learn not to pull. More than other models, head collars require a bit of getting used to. Introducing the collar and leash gradually is always good, as is monitoring your dog’s reactions. How do we know which dog harness is the best for us? The answer to that question is quite simple – it all depends on what you and your pooch need the harness for! For example, if you need a harness for a dog that’s elderly or has arthritis, you would go for one that doesn’t put a lot of strain on their muscles but still provides some good structure. You’d also want a model that you can lift fairly easily, with no risk of dropping. The harness that you choose for your pooch will also heavily depend on their size. Some models come in a range of sizes from XXS to XL, however, if your dog is too small or too big you might need to get them fitted for a special harness. 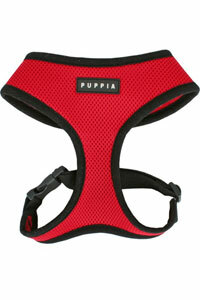 A way around the sizing issue is to choose an adjustable harness for puppies. Sizing accidents happen, and you don’t want to splash out for something that won’t even fit your dog in the end. This will do great in preserving your dog’s comfort. Furthermore, the material your harness is made of is really important. 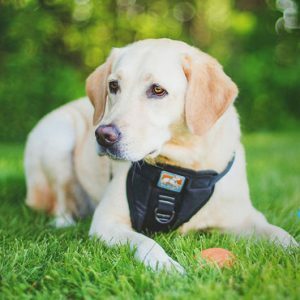 It needs to be durable and strong – polyester and nylon are the best options, especially when looking at the best dog harness for running. They’re also very easily washed, so it’ll make life a lot easier for you as well! Last but not least, your budget will also play a part in choosing your dog’s harness. We all know that owning a dog might end up being rather costly. Fortunately, dog harness vests tend to be really affordable, even the high quality ones! So it’s very easy to get a product that fits your price range without compromising on quality at all. There’s a lot of choice in terms of harnesses on the market, and that can be both exciting and confusing at the same time. Take a look at our top choices among the top dog harness to find a perfect match for you and your dog! Expert dog trainers have pointed out that this is currently one of the best harness for dogs on the market. It comes in a variety of sizes from XXS to XL, and all its straps are adjustable, giving your pooch all the freedom of movement they could ever wish for. The Ruffwear Front Range Harness has two attachment points – an aluminum V-ring on the back and durable, comfortable webbing on the chest. The effects of this harness are visible immediately. A quick tug on the leash gently stops the dog from pulling by refocusing them on staying by your side. That not only inspires a lot less pulling while walking but also helps with bonding with your pooch. The Ruffwear Front Range is very easily customizable in terms of size, so if your dog’s an awkward shape and you haven’t been able to fit them to a good harness yet, this is possibly your pick for the best no pull dog harness. Check latest price of Ruffwear Front Range Harness on Amazon. 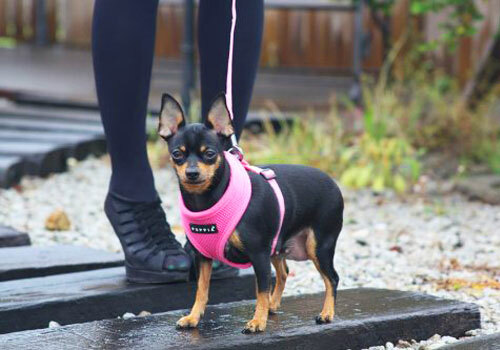 The Chai’s Choice harness is all about comfort and durability. 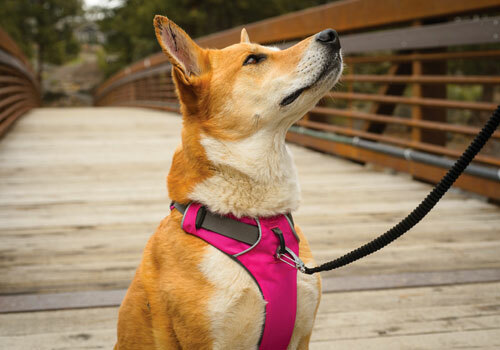 Built from high quality materials, this harness has some extra stitching reinforcements to ensure that your pooch is safe and happy on all their walks. The extra padding on the inside of the harness is great in preventing chafing and other harness-related injuries. The effects from this Chai’s Choice Front Range dog harness will be immediate, as you’ll notice a lot less pulling from your dog on day one. Another great feature of this harness is that it has a reflective thread making sure your dog’s visible during the night or the early morning. 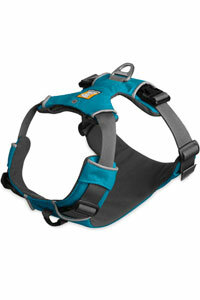 The Chai’s Choice harness also supports elderly or injured dogs. The two attachment points give a great versatility in leading your dog depending on their needs, and the adjustable straps are great for always making sure your furry friend is comfortable and happy. Check latest price of Chai’s Choice Best Front Range Dog Harness on Amazon. Made out of 100% durable, comfortable polyester, the Puppia Soft Dog harness is very lightweight, breathable and soft to the touch. Originally developed for small dogs, the product has been so popular that the company has added larger sizes, so now it accommodates pooches of all shapes and sizes. The chest belt in Puppia Soft Dog Harness is very easily adjustable and the neck padding is soft and comfortable to avoid the risk of chafing. It also features a D-ring on the back, making sure that any standard dog collars and leashes can clip on to the harness with no fuss at all. 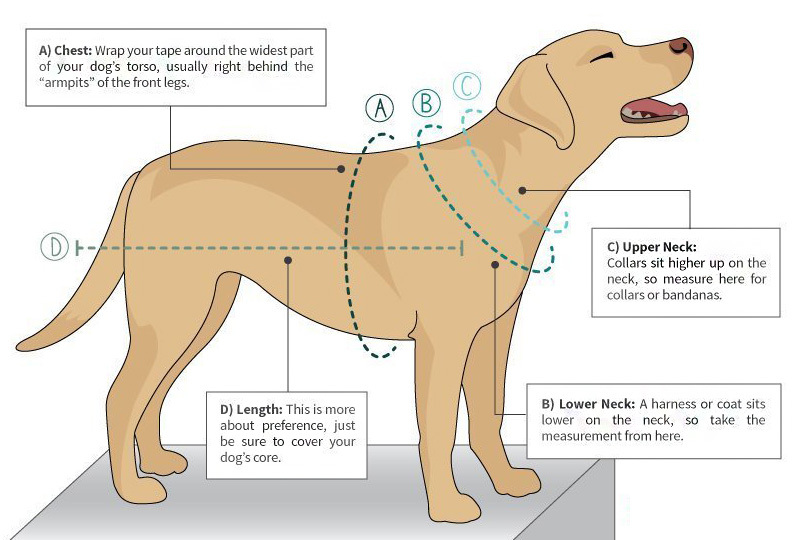 With this model, it’s very important to accurately measure your dog. Since the neck portion of the harness is not adjustable, you need to avoid the risk of choking or discomfort by taking correct measurements. As a rule of thumb, if your dog is between two sizes for the Puppia Harness, go up a size. 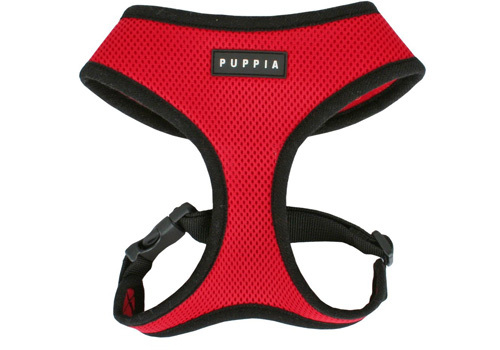 Check latest price of Puppia Soft Dog Harness on Amazon. The Kurgo Tru-Fit Smart Dog Walking harness is a comfortable, everyday harness with a no pull D-ring on the chest. This harness is all about the flexibility. It has five adjustment points that allow for a very custom fit for all awkwardly shaped dogs, and its variety of sizes can cover all pooches big and small. 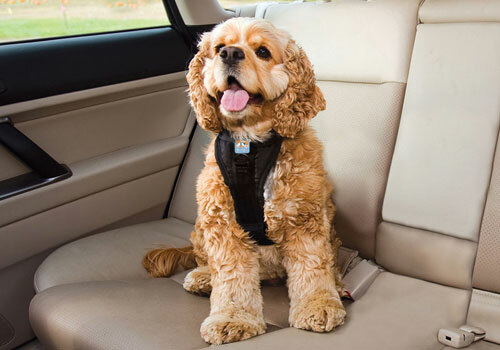 The Kurgo Tru-Fit can also double up as a car safety harness. The package includes a 10-inch lead, which can be easily buckled to the car’s seat belt system. When buying Kurgo Tru-Fit Smart Dog Walking harness, you will definitely be impressed by the sturdy quality of the build. It’s extremely durable, and it can hold its own in different conditions, from beach trips to mountain hikes. For its stunning quality, the Kurgo Tru-Fit’s price is extremely affordable and on par with other models out there. The product also comes with the company’s extremely handy hassle-free lifetime warranty. Check latest price of Kurgo Tru-Fit Smart Dog Walking Harness on Amazon. It’s time to focus on the types of harnesses and collars that we’d recommend avoiding when you can. Both of these are a very forceful and sometimes painful way of training your dog, which, if not used carefully and without the proper supervision, can lead to your pet sustaining serious injuries. Choke Chain Collars – Choke chain collars consist of a length of chain with rings at either end that tightens on a dog’s neck when he pulls. Some trainers suggest those when no other training works for hard pulling dogs, but without the proper way of using them, those might be very unsafe. Some breeds might respond well to it. Others should never wear a choke-chain collar, as it might impede their breathing severely; this is definitely not the best dog harness for small dogs. 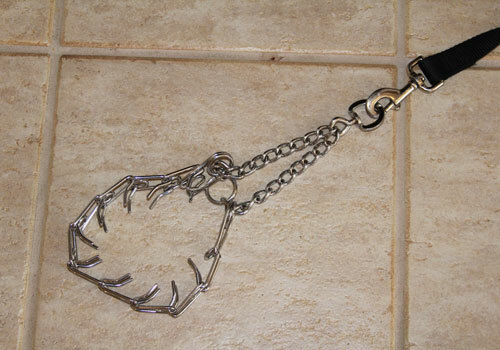 Organizations and experts in pet training have branded choke-chain collars as inhumane. We would suggest going for a head harness instead as a much safer option. Prong, or Pinch Collars – Pinch collars are often used against the most committed pullers out there. They have blunt prongs turned towards your dog’s neck that pinch his skin when the collar is tightened. Prong collars are considered to be marginally safer than choke collars, as they have a built-in mechanism to prevent them from tightening too much. These best dog collars and leashes might cause your pet to associate walks and jogging with the unpleasant pinch. With enough help from a vet or a trainer, even the most stubborn dogs can un-learn pulling without having to endure pain and discomfort. It’s important for your pooch to be safe and comfortable while wearing their harness. 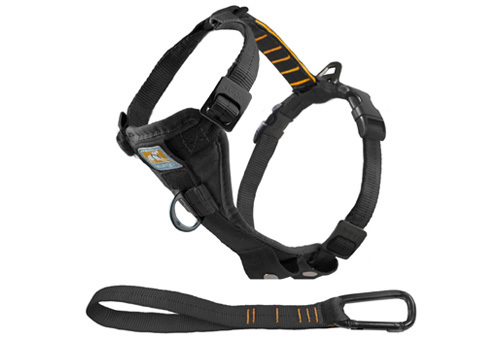 Follow these excellent safety tips for the best harness results. Remember to keep adjusting the harness according to your dog’s size. Dogs, especially puppies, grow and change with the speed of light. Make frequent checks to your dog’s collar, especially in their first year! You should be able to slip two fingers comfortably underneath of the collar. A well-fitted collar can save your pooch from skin problems and irritation, as well as severe discomfort. Harness for dogs are not replacement for collars. The main point of the collar is to carry your dog’s identification. Even if your pooch is microchipped, they always need their ID – just like you do! Remember that if your furry friend is seen wandering around without a collar, they might be mistaken for a stray. Harnesses are training tools, whereas the collars show everyone that this wandering dog does indeed have an owner! Starting early is the best option. Older dogs that have never worn a harness before might have a lot more difficulty adjusting to it. Harnesses are great for puppies, as they can teach good walking behavior early on! They help with stumbling and with getting used to regulated walks. Always observe your dog closely when introducing a harness. Some dogs take to harnesses much better than others. 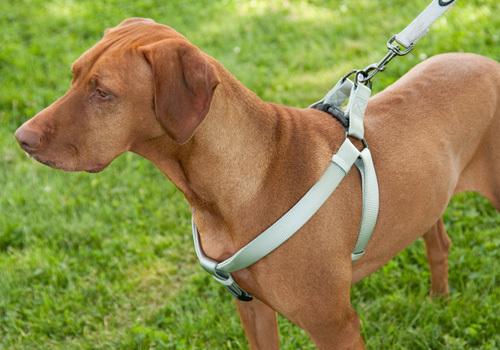 If you notice any redness or irritation around the area of the harness, consult a vet. 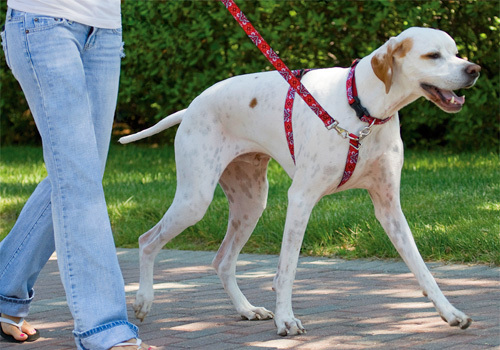 Most dogs take to harnesses very easily, but you should always exercise reasonable caution. The benefits of a dog harness vest only manifest when it’s used regularly. Depending on the way you put them on your dog, harnesses can be either step-in or pull-over. As seasoned harness experts, we’ve analyzed the main steps in putting each one on, to construct handy, easy to follow instructions. Different dogs prefer different types of harness, and both of these are proven to be equally effective. For step-in harnesses, you need to unbuckle and lay the harness on the ground first. Then, you should get your dog to stand over it, perhaps offering a treat as a reward when they do. Once your pooch is in the right position, take care to gently place one front paw in each loop. Over time, your dog will learn where the loops are and spare you the effort. The last step is to safely strap the harness in place. Pull-over harnesses are also very easy to use once you get the hang of it. Slip the neck piece around your dog’s head safely. Afterwards, pull the top straps over your dog’s back and the bottom – below the belly. It might sound hard and confusing, but once you’ve done it once or twice it will become so automated you won’t even think about it! The last step is, again, buckling up safely before the walk. After all this useful information, you might be feeling a bit dazed and confused about everything! 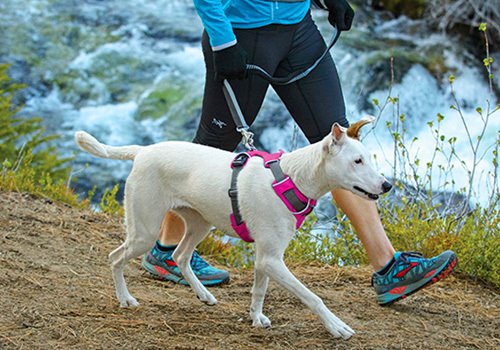 Fear not – we’ve gathered the Dog Harness 101 info right here. If you’ve got any ideas for anything else that might be included in this FAQ, feel free to drop us a line in the comments below! 1. Are dog harnesses harmful? Absolutely NOT! 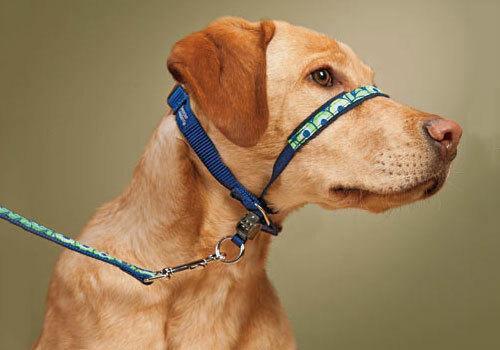 They’re even a lot better for your dog than the classic collar-leash combo! They distribute the pull force on a larger space rather than just on the dog’s neck, and they are very useful in so many other ways, like reflecting light when visibility’s low. 2. Which dogs are best suited for harnesses? Harnesses are great for natural-born pullers. 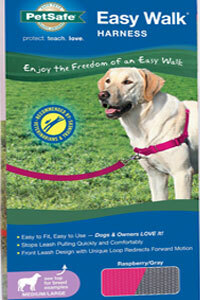 Front attachment harnesses teach your dog not to pull on their lead by reversing their attention back to you. They offer a gentle reinforcement for better discipline and inspire great no pull behavior. The effects are visible on the very first use of the harness! 3. Which type of harness is the easiest to use? It all depends on your dog’s personality. 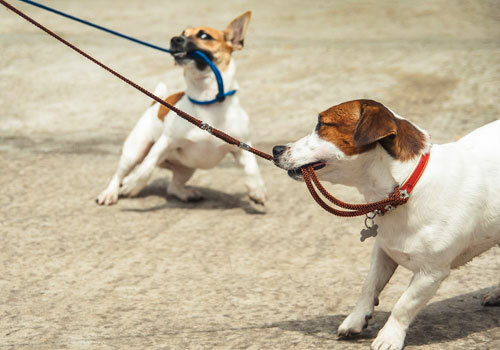 If your dog’s got an affinity for strong pulling, you might want to go for a head harness or a front attachment harness to inspire some disciplined walking. If you’re looking for a harness that’s good for jogging, running and biking then the back attachment harness is probably the better choice. 4. Can I use the dog harness on puppies? Dogs should be taught a good walking behavior from an early age! A best no pull dog harness isn’t only a method of teaching your pup to walk calmly, but it also helps with temperamental pups – often stubborn and trying to fight their collar and leash. Harnesses also help with reducing stumbling and tripping at a young age. So what’s the verdict on the dog harness? If you need to teach your pooch some fine walking behavior then a dog harness is definitely the right choice for you. They are perfectly safe and a lot more convenient than the collar and lead combo, as long as you make sure they’re properly fitted and good for your pet. Dog harnesses are a gentle, non-intrusive way of teaching your pulling dog good walking manners. They don’t hurt your dog in any way and rely on positive reinforcement for training. Harnesses are also great for elderly or disabled dogs, and they can make day-to-day activities like walking or climbing up the stairs a lot easier. The best dog harness is out there, waiting for you and your pooch to make a perfect match – this guide will definitely help you find it! Ruffwear Front Range Harness was reviewed by Brian Hersh on August 20, 2018. *Disclaimer: Our best dog harness reviews are based mostly on our expertise and the experts/veterinarians we consulted with and the information provided by the manufacturers. We do test many products, but it’s not possible to test them all. As such, please remember the above recommendations are our opinions, and before using any treatment, please consult with a local veterinarian.